Divorce brings about so many changes in the lives of everyone it touches. While this is apparent on a daily level, this feeling of change is often magnified when special dates like holidays come around. Many have expectations for the holidays, anticipating the same traditions to happen each year. After a divorce, those rituals may evolve in such a way that forces you to consider creating new traditions. Even if you are ready to accept this, the time leading up to the actual holiday can feel brutal. Facing these changes isn't easy after a traumatic change in the family, but there are things you can do to help yourself make it through the holidays with less stress or sadness. Here are three tips for beating the pre-holiday blues. Holiday schedules aren't ones to be made last minute, especially when kids are in the picture. 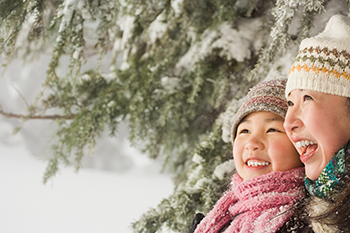 With your co-parent, work out a plan for how you'll spend the holidays. Your plan may involve having your children split your time with each of you, and if so, discuss how you'll move your kids from one place to another. If that just won't work due to location or timing and your children will only be with one of you, consider working out some other time where your kids can be with their other parent to celebrate the holiday together. Once you know the schedule, make sure your children understand it. They may be feeling just as apprehensive about facing the holidays as you are, knowing that it won't be the same as it was the year before. Talk to your kids early on and explain what the base plans will be like where they'll be spending the day and night on the actual holiday as well as the days leading up and following if that is included in your holiday plan. Going through the holiday plans ahead of time will help to relieve their pre-holiday blues and help them experience the holidays with less stress. When you have something to look forward to, it's easier to feel excited and happy about the future. Instead of getting yourself stuck on thinking about how different the holidays will be this year, try focusing on the new traditions you would like to try starting this year. If you'll be with your children over all or part of the coming holidays, get them involved with planning new things to do. Ask what they'd like to do and try to incorporate their desires into your plans, even if some ideas are a little unconventional for the holiday in question. Let yourselves be creative in order to make the upcoming holiday one that you can all look forward to together and not get stick in the blues beforehand. In some instances, a parent may find that they must spend all or part of the holidays away from your children. This can be a tough realization for many parents, worsening the pre-holiday blues. If this is the reality you face, work towards beating the blues by thinking about how you'd like to spend the holiday. Maybe you already have plans with family or friends, and if so, focus on the parts that make you excited about the holidays to come. If you don't have plans, think about how you'd like to spend your time. Think of something that you would enjoy doing, and plan ahead for it. Let yourself enjoy this time and create new memories that you can look back on and remember having a good time, not feeling blue. Pre-holiday blues is not abnormal, for adults and children. It's tough for any person to face big changes over dates that have historically been so memorable and important, but the truth is that it's always possible to make holidays—let alone any average day— special by putting your mind in the right place and planning ahead a bit. Get your plans in place for the holidays, and discuss the agenda with your children so that there are no surprises day-of. Involve your kids in coming up with ideas for new traditions to try out over the holidays, and honestly consider them even if they're a little out of the ordinary. If you happen to find that you'll be spending some time alone over a holiday, think of something you can do that you can look forward to. This is your family's time to write a new chapter in your holiday history, so help yourself enjoy it by focusing on the brighter side of things.